‘Thanks for the question, Ken. The Georgian Navy was colourful and individualistic in its headwear. 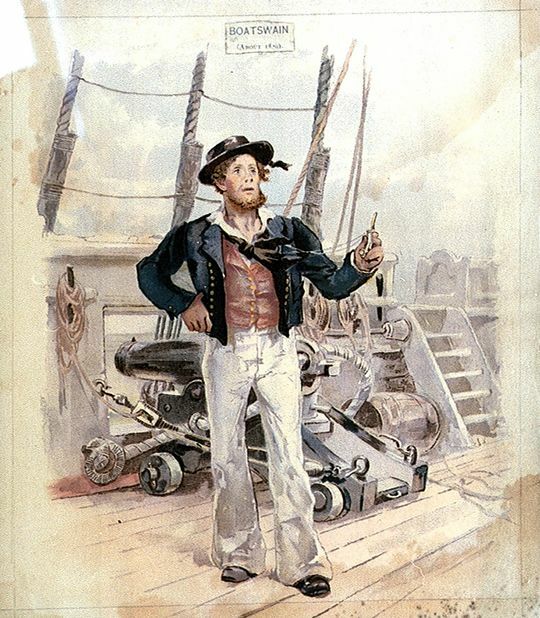 Both sailors and officers had different ‘levels’ of attire at sea – sensible working rig, and clothing more suited to a formal occasion or going ashore. For officers this division was broadly ‘undress’ uniform and full ‘dress’ uniform. As well as being an indication of rank/rate, headwear kept the elements at bay – both sun and rain. Many chapeaux were coated with a water-proofing. It surprises many that Jack Tar actually didn’t have an official uniform before 1857. His typical outfit in Kydd’s day was ankle-length white “trousers” and a short blue jacket. Shirts were often a colourful red check, and it was a euphemism for punishment by the lash to be said to have been given a ‘red-checked shirt at the gangway’. Many sailors wore a kerchief at the neck. This could be knotted around the head in battle to keep sweat from running into the eyes. A cocked hat would be useless up in the rigging as it would be easily blown away – a sailor often chose a hat with a small brim made of leather or straw with a ‘chin stay’ to keep it in place, or a woollen or fur “monmouth” cap. 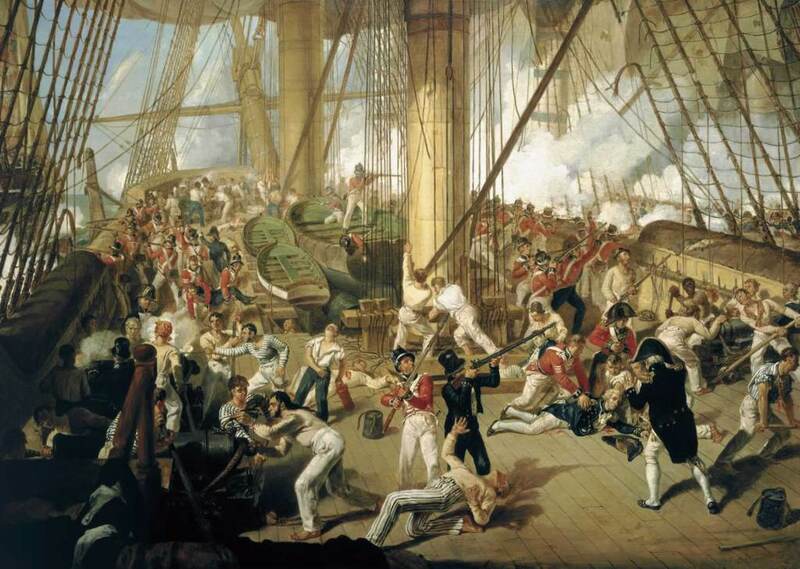 Officers’ uniforms were prescribed by the admiralty at various times – 1795, 1812 etc. but these were really only guidelines and there was a range of sartorial flair shown, especially amongst officers with private means. Bicornes were the most fashionable headgear by 1800, really the well-known tricorne with its front retracted and therefore worn crossways. By 1805 flatter bicornes were the more popular, worn “fore and aft”, although more conservative officers wore them in the old style. In general, the uniforms of the marines followed those of the army, with a lag of a few years. In the late eighteenth century marines wore the standard light infantry hat with a large plume over the top. By the early years of the nineteenth century when honoured with the title ‘Royal Marines’ headgear was a hat (made of glazed leather) without a feather, cocked up to one side by two tapes. The full marine uniform was worn for guard duty aboard ship and for landing parties. No doubt in the height of action jackets were removed and hats set aside or knocked off. This would have been even more the case in the fighting tops, where a cap could be blown off. Julian can you tell me what was or is HMS VICTORY’s Pennant Number? Well, it’s a fact that the current Bridge Card, carried on the bridge of every Royal Navy warship at sea at the moment, lists Victory but notes she does not carry a pennant number. In the past her pennants would depend on which fleet she was attached to, the last of which was Saumarez in the Baltic in 1809-12. Delighted you’re enjoying CARIBBEE, and Merry Xmas to you and yours, too. Ken Smith’s questions about naval “hatwear” was on my mind as well. It might seem … er, seemly .. to wear hats on the weather decks, but I often wondered why .. especially far at sea. Every man no doubt knew every officer by sight. I can’t think of a valid useful reason except for direct sun. And, BTW, I am delighted to experience in my day the LAST official usage of fore-and-after hatwear. The change of command in 1957 was a formal affair aboard Presential Flagship Northampton CLC-1 .. and I was there. Will Kydd ever come in contact with the US Revenue Cutter Service, pre-cursor of the US Coast Guard? I’m a retired CG Commander and would revel in that encounter. Kydd may well do in a future book, Bill. Best wishes for the Festive Season.